This amazing movie is a must watch for almost any fan of movies. 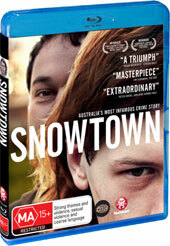 Snowtown tells the tale of the enigmatic serial killer John Bunting, and how he and his followers killed anyone who got in there way in the small towns in the outer Adelaide suburbs. This film became a title that I had to view from the outset due to the limited cinematic release around the country which personally I found ridiculously unsupportive of the local industry. Unfortunately I missed it due to the movie never coming to a cinema near me and this release was the first chance I have to check it out..... by god it didn't disappoint. This movie is stunning to look at. Beautiful cinematography treats the eye to some truly heartbreaking scenes, of shocking suburban living conditions, right through to amazing views of the countryside. This is most certainly an Australian movie, and you feel it in your bones as you are watching. I remember this story being on the news and the performances turned in by the cast totally immerse you in the shocking reality of their circumstances. Something that is worth knowing is that all but two of the actors in this film are just ordinary people off the street with little to no experience, and the performances are utterly stellar. For those with weak stomachs, I can let you know that even though there is violence throughout, it's more the violence that is insinuated that messes with your head. The pacing is perfect, and whilst at times the onscreen action is enough to make you cringe, there is never a violent action show just for the sake of it. It's always for a reason. The movie follows the experience of young Jamie played by Lucas Pittaway, and how through an utterly terrifying and abusive (both sexually and mentally) upbringing, he falls under the spell of John Bunting who treats the boy the way that he has been hoping a father figure would treat him. It's not until his suspicion of Bunting manifests that Jamie is drawn into a terrifying world dominated by this killer, played amazingly by Daniel Henshall. The video on this film looks great with a bit of grain showing throughout. This does nothing to detract from the viewing experience. Audio is a chilling affair that accentuates the tension of the scenes you are watching. Utterly amazing. The extras on this blu-ray flesh out more of the story with casting videos, an interview with the director and loads more. There a number of short movies on here which personally I couldn't understand why they were there. It seemed to take a bit away from the rest of the disc and I would have preferred there to have been more about the movie to have given us more insight into the making of this amazing movie. This would have to be one of the best Aussie movies I have seen in ages. The story whilst based on real events, could still have been let down by poor performances and direction, however this never occurs and what we are instead treated to is one darkly beautiful and disturbing movie. You really owe it to yourself and our local talent to check out this movie. This is truly a must see and own movie if you are into the genre and/or Australian cinema.